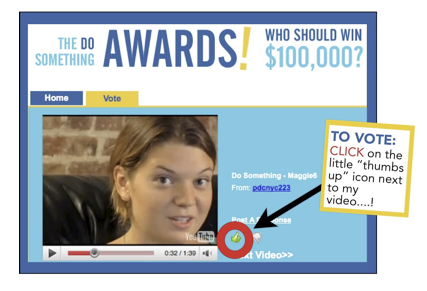 ...like vote for maggie doyne, one of the five DO SOMETHING AWARDS finalists. i came across maggie doyne's blog quite a while ago and have posted about her quite a few times now. i've never met her...or even talked to her. but she inspires me to be greater, do greater and believe in myself and my dreams. and so now...i hope that i can inspire you to go vote for this amazing young girl, who is doing her part to change the world. and if you don't, at least go check out her blog because, after reading the amazing things she has accomplished in her short twenty-two years (that all started with her saved $5000 of babysitting money), you will probably change your mind and go vote. so just do it... go vote. we need more maggie doyne's in this world. and at a minimum, we need to spread the word about what this amazing young woman has accomplished and continues to do.